I see a purple sun. Pretty! This photo makes me so happy! Gorgeous - love the vibrant colors. What a stunning little capture you have there... Love it!! I love the purple - it is a good start to the morning! I suddenly have this desire for an outfit in that color. what bright happy flowers ..
Love the sharp focus of the flowers and the muted focus of the leaves. Beautiful shot! That is a great image! So radiant and vivid! I love this photo. You make me want to learn how to take better pictures! Flower pictures are my favorite! Love these asters. I don't have asters in my garden.....wonder why, they are so pretty. How pretty! Such a bright color. Lovely! I miss having these in my garden. The bunnies ate all of my asters last year and the plants didn't come back in the spring. Bad bunnies. 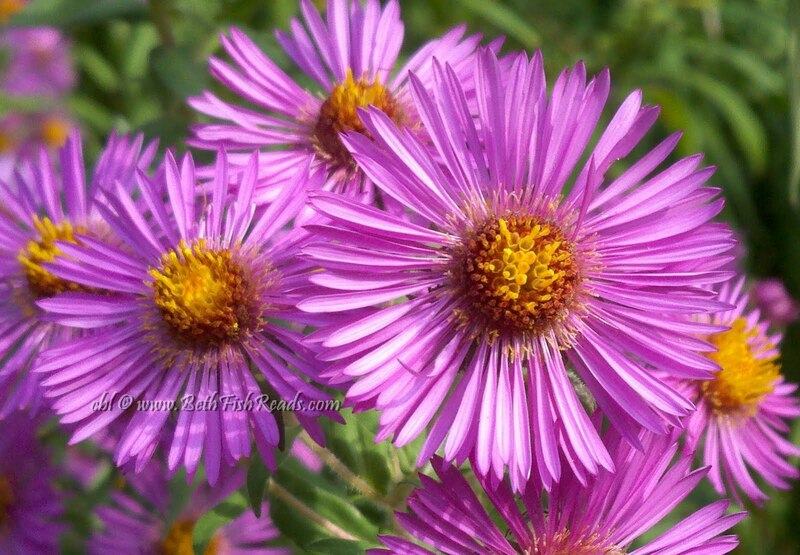 My neighbor's asters are in full bloom and look so cheery. Like Leslie, the rabbits have eaten all of mine, as well as the Black-eyed Susans and Coneflowers. Grrrrr.